Creepy skeleton is dressed like the grim reaper and holds a sign that says "Welcome"
Easy Assembly : Pre-assemble with 50 clear and purple mini bulbs. Skeletons eyes green bulbs. 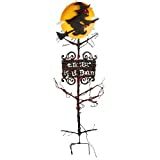 BOO Pre-lit Halloween Decor Make a real statement this Halloween with our delightful BOO Pre-lit Halloween Decor. This fun outdoor light fixture is a most appropriate way to greet October guests, in glowing, all-weather style. Pre-Lit Beware Sign Warn of spooks ahead with our Pre-lit Beware Sign. Blood-red, all-weather letters appear to float above your lawn when attached to their included stakes. Corpse Solar Light He just wants to get a little light in his world. He's got both feet in the grave, but blame it all if he won't keep his head and hands in too. This gruesome ghoul has his head popping out and his rotting arm too. At least he's holding a light to dig by. 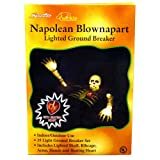 The Corpse Solar Light is 17" tall and includes a solar lantern. No need to replace batteries because this one runs on solar light. Pair with one of our tombstones (sold separately) to get a great night of the living dead feel. 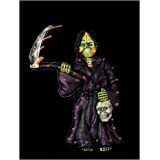 Fright Light This wall decoration has a grey stone backing with a bone colored skeleton head that has a melted candle on top of his head that is made of foam and measures 15" high. Standard candlabra light bulb fits into the top of the candle. Light bulb not included. 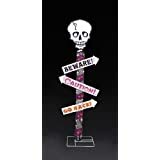 # Dimensions: Height: 90.0 "
Three post skull sign reads: "Beware! ", "Caution! ", and "Go back!". Weather resistant. 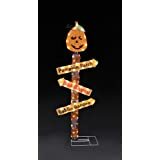 # Dimensions: Height: 72.0 "
# Dimensions: Height: 27.0 "
# Dimensions: Height: 19.0 "
Ghost Porch Light Cover Ghost Light Cover is made of plastic and has an elastic band on the back. Measures approximately 11" high x 8" wide x 4" deep. 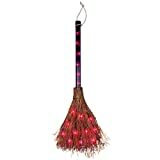 Sparkling Pumpkin Porch Light Cover Package includes 1 sparkling pumpkin porch light cover. Measures approximately 12.25" high x 9" wide x 3.5" deep. Cover is made of pelletized plastic that gives it a "sparkling" look. Also has an elastic band on the back. Fits most porch light fixtures. Can also be used for post lamps. • 4 X 11 "
Scary Night Eyes Passers-by will cry "what was that?!?" when these eerie eyes glare at them in the darkness. Only you'll know it's not a goblin or wild animal! A built-in sensor makes the eyes light up at night and go off automatically at dawn. Fun for everyone! All-weather polyresin. 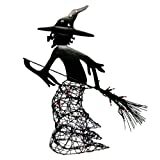 Lighted Halloween Figures Our all-weather, flying Lighted Ghost Figures are an easy, tasteful way to create a frightening focal point for your holiday display. * Life-sized figure incorporates a rugged, commercial-quality steel frame * Finished in a durable powdercoat that ensures reliable, all-weather service for years to come * Bright-shining mini lights last up to 3,000 hours Hang in a tree, from eaves, or use optional Ground Stake. 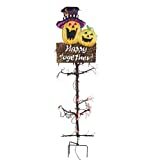 Haunting Halloween Tree Decor Put a little frightful fun into your décor. Trio includes 3 inflatable 6 x 12" polyester bats that hang from tree limbs with Velcro® straps; metal springs for bouncing realistically in the breeze. 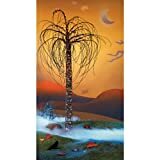 Inflatable 15 x 28" ghost secures to a tree trunk with a 24" vinyl and Velcro® band.